WHAT’S NEXT FOR SOLAR MANUFACTURING OPERATIONS? Solar is a real success story, now recognized as the world’s primary source of renewable energy. According to the Solar Energy Industries Association (SEIA), solar has experienced an average annual growth rate of 68% in the last decade. Nearly 260,000 Americans work in solar – more than double the number in 2012 – at more than 9,000 companies in every U.S. state. The cost to install solar has dropped by more than 70% since 2010. Commercial prices have fallen by 58% since 2012 and by 16% in the last year. Nevertheless, the Western solar industry is struggling to survive a major market downturn this year. 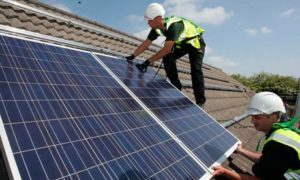 Despite imposing import tariffs to protect domestic industries and unblocking millions in subsidies to boost the development of their green energy sectors, the USA and European countries have had to face stiff competition from Chinese solar panel makers flooding the market with solar panels manufactured at unbeatable prices, boosted by generous Chinese government subsidies. Domestic manufacturers have quickly lost market share, leading to bankruptcies, plant shutdowns, workforce layoffs, and severe deterioration of the Western solar industry. Technology: In some cases, Western solar companies have developed more advanced technology and their acquisition would enable Chinese manufacturers to enhance their manufacturing capabilities more rapidly than through organic means. Trade issues: The U.S. may put in place emergency safeguard tariffs on imported solar cells. Buying U.S. solar companies with domestic manufacturing facilities would allow Chinese companies to side-step tariffs on imported solar cells. The solar industry is likely to consolidate for the rest of 2017, enabling the few larger, more stable companies left in the industry to appeal to investors and slowly push weaker suppliers out. Now more than ever, solar companies need to devise a sound manufacturing asset disposition strategy to limit their losses. Should your company consider divesting or acquiring solar manufacturing assets in the near future, we would welcome the opportunity to discuss your needs and present our capabilities. To set up a consultation, please email Vice President Nick Papa or contact him by phone at +1.206.268.7808. ATREG is pleased to announce that it has appointed Malcolm Penn to its Advisory Board. Malcolm is Chairman and CEO of UK semiconductor industry analyst firm Future Horizons which he founded in 1989. Malcolm has over 50 years of experience covering all aspects of the semiconductor and electronics industry, including new business development, management, manufacturing, marketing, and design. Prior to creating Future Horizons, he served as Vice President & Director of European Operations for Dataquest (now Gartner), responsible for establishing and running all European research operations. Prior to that, he worked as Manager of Component Engineering for ITT Europe (now Alcatel) and before that held various operations and marketing management positions with ITT Semiconductor Group (now Micronas and General Signal), including Executive Director of ITT’s UK-based front- and back-end semiconductor operations. Prior to ITT Semiconductors, Malcolm served as a Systems Design Engineer at Venner Electronics, a UK company specializing in the design and development of electronic measurement instrumentation.